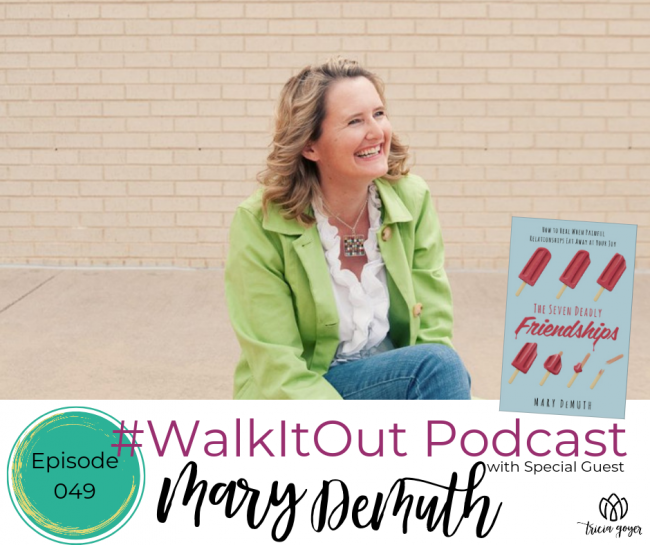 On this week’s episode of #WalkItOut Podcast, we’re chatting with one of my best friends, Mary DeMuth, about her new book 7 Deadly Friendships. Today’s guest is Mary DeMuth, and we’re going to chat about friendships. I love friends— and I am blessed with so many friends! Pretty much if we’ve ever talked for more than five minutes, we’re going to be friends for life. Friendships are wonderful. I love getting to know people, I love encouraging them and inspiring them — but I should say, friendship is wonderful … until it’s not. I’ve had those challenges in my life. I’ve had dear dear friends where circumstances pull us apart or people that I’ve gotten to know that as we’ve gotten deeper into our relationship, I’ve discovered that they are not really who I thought they were. Have you’ve ever had a friendship that was difficult, or maybe even deadly? I think it’s helpful to know that sometimes there are those friendships that are not healthy that we need to walk away from. I’m excited to share Mary with you today as she talks about friendships and her new book, 7 Deadly Friendships. I know you are going to be blessed by this conversation with Mary! You can listen above or on iTunes! I’d love it if you shared with your friends!